UNSW Sydney scientists have discovered the purpose of a famous 3700-year old Babylonian clay tablet, revealing it is the world's oldest and most accurate trigonometric table, possibly used by ancient mathematical scribes to calculate how to construct palaces and temples and build canals. 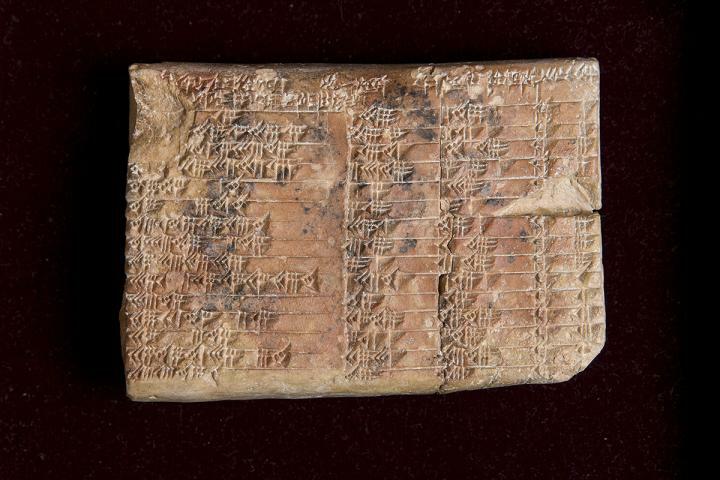 The new research shows the Babylonians, not the Greeks, were the first to study trigonometry – the study of triangles – and reveals an ancient mathematical sophistication that had been hidden until now. The UNSW Science research provides an alternative to the widely-accepted view that the tablet was a teacher's aid for checking students' solutions of quadratic problems. "The huge mystery, until now, was its purpose – why the ancient scribes carried out the complex task of generating and sorting the numbers on the tablet. "Our research reveals that Plimpton 322 describes the shapes of right-angle triangles using a novel kind of trigonometry based on ratios, not angles and circles. It is a fascinating mathematical work that demonstrates undoubted genius. The Greek astronomer Hipparchus, who lived about 120 years BC, has long been regarded as the father of trigonometry, with his "table of chords" on a circle considered the oldest trigonometric table. "Plimpton 322 predates Hipparchus by more than 1000 years," says Dr Wildberger. "It opens up new possibilities not just for modern mathematics research, but also for mathematics education. With Plimpton 322 we see a simpler, more accurate trigonometry that has clear advantages over our own." "A treasure-trove of Babylonian tablets exists, but only a fraction of them have been studied yet. The mathematical world is only waking up to the fact that this ancient but very sophisticated mathematical culture has much to teach us." Dr Mansfield read about Plimpton 322 by chance when preparing material for first year mathematics students at UNSW. He and Dr Wildberger decided to study Babylonian mathematics and examine the different historical interpretations of the tablet's meaning after realizing that it had parallels with the rational trigonometry of Dr Wildberger's book Divine Proportions: Rational Trigonometry to Universal Geometry. The UNSW Science mathematicians also provide evidence that discounts the widely-accepted view that the tablet was simply a teacher's aid for checking students' solutions of quadratic problems. "Plimpton 322 was a powerful tool that could have been used for surveying fields or making architectural calculations to build palaces, temples or step pyramids," says Dr Mansfield. The name is derived from Pythagoras' theorem of right-angle triangles which states that the square of the hypotenuse (the diagonal side opposite the right angle) is the sum of the squares of the other two sides.